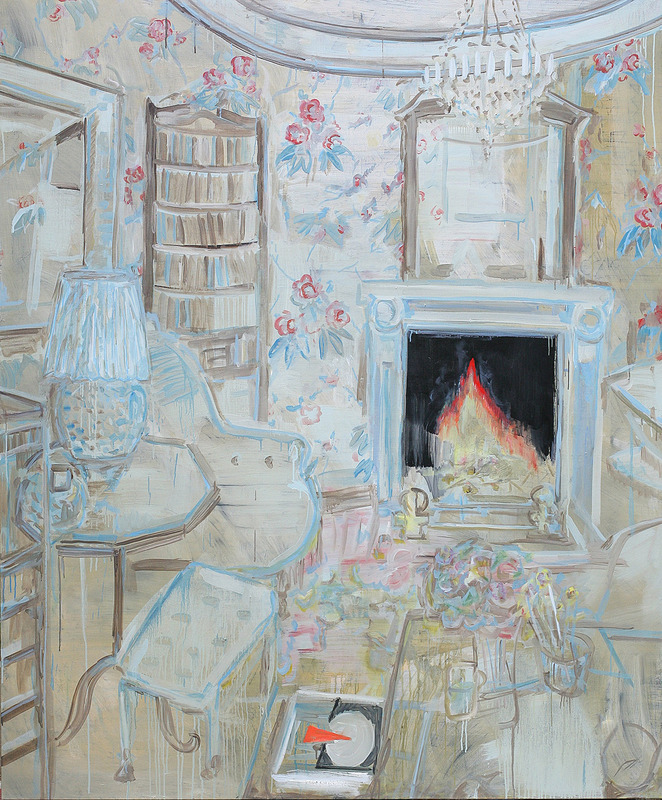 “At first glance, the picture Revolution on the Table (2011) is merely a painterly reproduction of a photograph taken in 1980 of an award-winning French living-room design, complete with flowery wallpaper and a fire burning in the fireplace. However, a couple of surprising details make reference to Russian avant-garde art, which revolutionised the art world almost a century ago. “The fireplace cavity is for example painted to remind the viewer of Kazimir Malevich’s famous painting “Black Square”, which represented a reduction of all conceivable content, and was included in the first Supremacist exhibition, ‘0.10’, held in 1915 in St. Petersburg. And on a small table in the foreground of the painting, we see a book whose cover is a reproduction of El Lissitzky’s famous graphic image “Beat the Whites with the Red Wedge” from 1919. The red wedge forcing its way into the white circle symbolises the struggle of the Red Bolsheviks against the ‘White’ royalist forces during the Russian civil war that followed the revolution of 1917. “As a student of Kazimir Malevich, El Lissitzsky was also part of the Russian avant-garde, whose constructivist art was intended to help in the construction of a new socialist society, and was therefore employed in the service of communism immediately after the revolution. 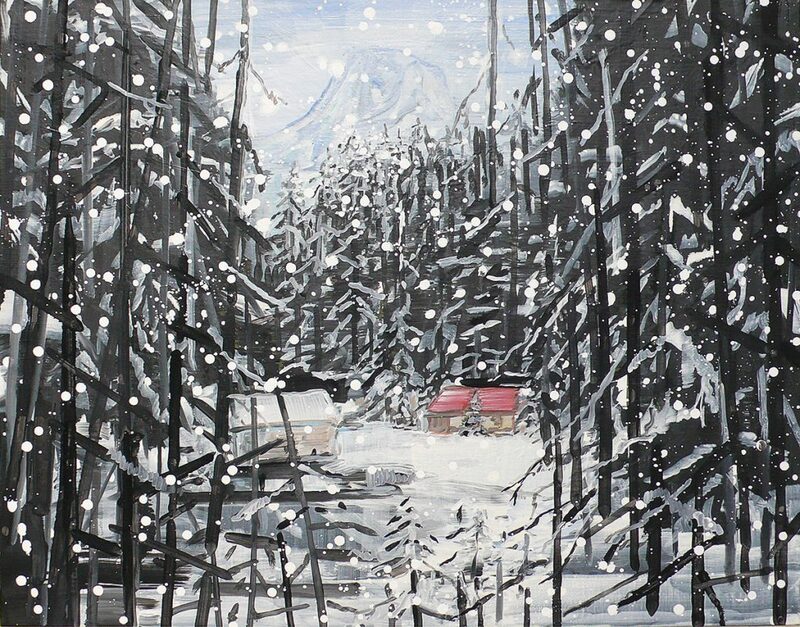 Just a few years after the revolution, however, avant-garde art fell out of favour in Russia. It became brutally suppressed, and when in 1934 Stalin declared socialist realism to be the Soviet Union’s official artistic idiom, this brought down the final curtain on this innovative art form and its practitioners. “Seen in this light, Revolution on the Table is a work that is critical of ideologies. But it is not just communist ideology and the utopian conceptual system of Supremacism that Adach targets; by placing a utopian and groundbreaking avant-garde work in the middle of the living room table, he also asks whether we in the Western democratic world are prepared to settle for kitsch, retrograde design as an image of the creative utopias of our time. “By incorporating a pair of avant-garde icons into the bourgeois room, Adach also points out the eternal dilemma and trauma of avant-garde art: the threat of being absorbed and reduced to an item of use and decoration in the service of another ideology – as was the fate of Kazimir Malevich’s icons ‘Black Cross’ and ‘Black Square’, which adorned German military vehicles during the war, and the street art of our own time, which is gradually being reduced to the status of commercial products for sale. 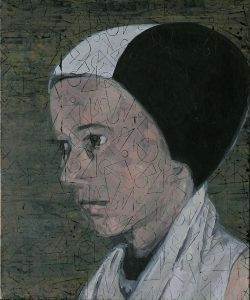 “Adach also combines references to interior design and Russian avant-garde art in the two portrait paintings Kobro alone with her daughter (2011) and Strzeminski (2011). The first of these is a portrait of the Polish sculptor and avant-garde artist Katarina Kobro, who was married to fellow artist Wladyslaw Strzeminski, the subject of the second portrait. Both were students of Kazimir Malevich around 1920, and were part of the circle of the world-famous master in Vitebsk, as well as Lissitzsky’s group Unovis. “In the early 1920s the couple travelled to Poland, where they introduced Malevich’s Suprematism and founded their own Unism as a constructivist but autonomous style, in which, in both painting and sculpture, abstract spatial structures were constructed on the basis of mathematical principles. “Adach has reproduced the portraits of both these artists in a naturalistic style, but the surface is filled with abstract geometric forms. These forms were apparently applied by Adach using one of the popular rubber paint rollers commonly used in communist Eastern Europe to decorate living-room walls. Revolution on the table (Klinom krasnym bei belykh), 2011, oil on canvas, 180 x 150cm. 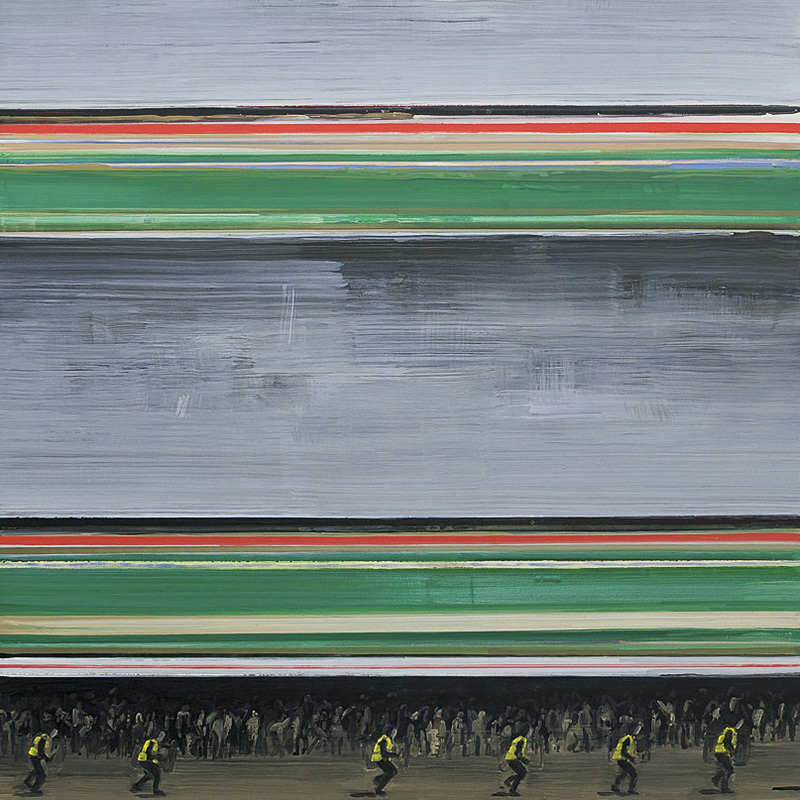 Dictator’s cradle, 2011, oil on canvas, 73 x 92 cm.